Going hiking is every Coloradan’s favorite activity. Taking in the fresh air and experiencing our natural scenery is appealing. But one aspect enhances it even more: your dog. As a dog owner, I’ve had to explore many trails to find the right ones, since not all hiking destinations are suitable for pets. However, this list should give you a good idea of where to take your furry friend. Address: 1805 N. 30th St.
Garden of the Gods Park has many different hiking trails and colorful red rocks. I’ve taken my dog here numerous times. As long as you have your dog on a six-foot leash and clean up after them, you’re good to go. Dogs can run unleashed west of 30th Street. and south of Gateway Road. As for the other areas, visitors are encouraged to remain those marked as official trails. Around 336 parking spots are available to leave your car, according to Garden of the Gods’ official site. 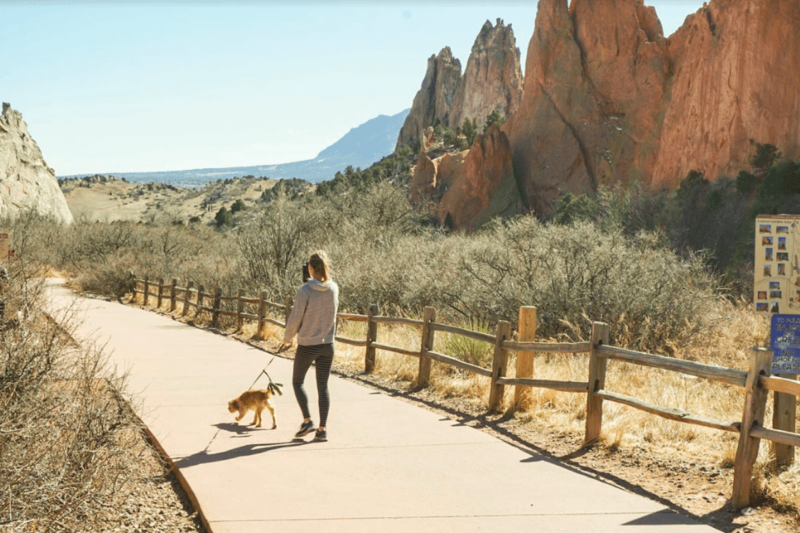 Address: 3550 W. High St.
Red Rocks Canyon Open Space is a great choice to explore with your dog. The upper and lower dog routes on the trail are off-leash, so your dog is able to run freely. The trails range from 1 to 4 miles and welcome all types of creatures: humans, dogs and horses. There are seven trails to choose from, some that overlook Highway 24 on the way to Manitou Springs and others that loop around the open space. Address: 2120 S. Cheyenne Canyon Rd. North Cheyenne Canyon Park, specifically Cutler Pass, is my favorite path to explore. Cutler is about a 2-mile round trip with a great view of the city. This hike can be done in the perfect amount of time in between classes to get your outdoor fix on a nice day. North Cheyenne Canyon Park is a common destination for tourists and natives in the area to go hiking. The park itself has 20 miles of hiking and biking trails and is a great place to explore with your dog. Hours: 7 a.m. to 9 p.m.
Another one of my favorite places to go is Palmer Park, which also offers an off-leash dog park. This trail is about 25 miles and can be accessed from Lot 24. I love this trail, but it’s a pretty popular spot and there are usually plenty of other hikers. Students can scale up to the summit of Pikes Peak on Barr Trail, which is 12 miles long. While I don’t hike all the way to the top, the trail is a great hike to do with your dog as it is marked well. If you want to hike the entire 12 miles to the summit, it will take you six to ten hours. Summer is the best time to hike Barr Trail. If you’re from out-of-state and not adjusted to the high altitude (the trail is a 7,500-foot gain), practice on some other trails before trying this one, as it can be strenuous. Address: 3440 N. Cheyenne Canyon Rd. Helen Hunt Falls provides a spectacular view at the end of the trail: a waterfall. You can get here from North Cheyenne Canyon Park and enjoy the view of the waterfall from its base, or take your dog up to the top. The walk is short and non-strenuous. Hike a few more feet up to the top to Silver Cascade Falls, and you’ll have the best view of Cheyenne Canyon.